Not a history of life as much as a picture book with 100 beautiful photographs of fossils, each accompanied by a pagelong essay on its role in evolution. 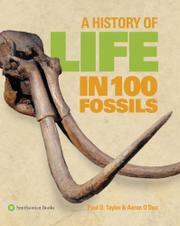 Paleontologists Taylor (co-author: Fossil Invertebrates, 2005, etc. ), who has worked for three decades at the Natural History Museum in London, and O’Dea, a staff scientist at the Smithsonian Tropical Research Institute in Panama, emphasize that a minuscule fraction of the bones, shells, teeth, stems and leaves of extinct life survives as fossils, and even fewer soft body parts, stomach contents, feces, eggs, embryos and nests. However, a minuscule fraction of trillions is still a superabundance, from which the authors have chosen the crème de la crème. Life began less than 1 billion years after the Earth cooled 4.5 billion years ago. The earliest life forms may resemble bacteria, and the book’s first photograph of rocks containing microscopic, branched filaments will impress general readers as examples of primitive life. Matters quickly improved, illustrated by the following photograph, a swirling mass of stromatolites, layered deposits of bacteria that spread over the oceans 3.5 billion years ago. They produced oxygen, which, after a few billion years, led to the explosion of complex, multicellular, oxygen-breathing organisms 600 million years ago. The following pictures reveal odd, soft-bodied floating blobs that evolved into creatures that crawled, swam, spread onto land a few hundred million years later, and developed into familiar reptiles, mammals and primates. Despite the terrific photographs, the avalanche of information in the text may overwhelm beginners, who should read a genuine history of evolution—e.g., Richard Fortey’s Life (1998)—before dipping into this treasure trove.